Winter arrives in Minneapolis carrying two sacks. In one is the bright hustle and bustle of the holiday season. In the other are the frigid cold temperatures that threaten vulnerable families. To boost the fun part of winter, O’Keefe spreads the magic of the holiday season by working with a colleague from Catholic Charities to connect families to a Christmas gift program run by Sponsor a Family MN, a local nonprofit. “Every single family in our school can sign up for three Christmas gifts for every member of the family that lives in the house. The adults and the kids get three gifts.” Often, families ask for winter coats and boots. Sponsor a Family mobilizes community support by choosing sponsors for families in need. These sponsors “can be individuals, businesses, community organizations, churches, religious organizations or anyone who wants to help.” An essential piece of the program is having O’Keefe and other case managers verify families’ needs. “Families pick up their gifts a week before Christmas at a huge warehouse. It’s amazing to go to. Families are just so excited to pick up their gifts.” The program supports 600 families in the area, 250 of which are Risen Christ families. Another community partner is the Pax Christi Catholic Church which takes a two-pronged approach to supplying winter necessities. 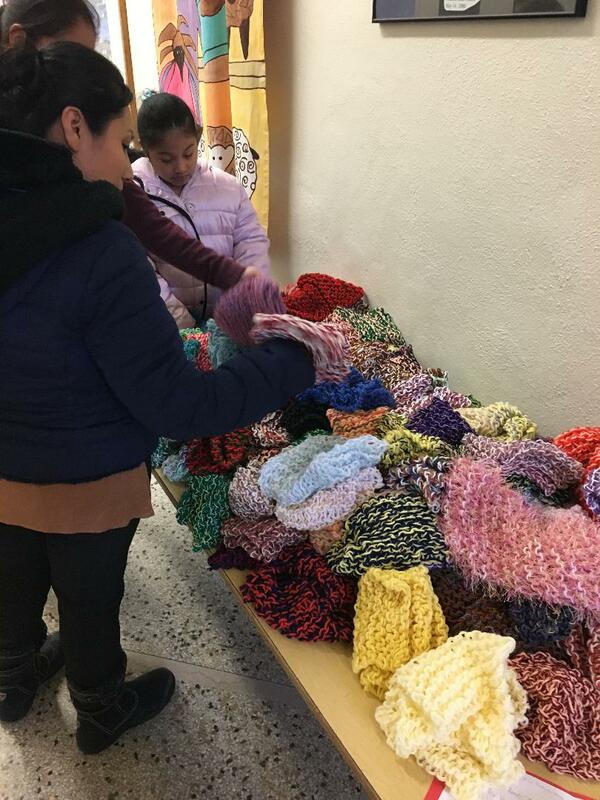 A group of knitters make hats, scarves, and mittens. The church also runs a donation drive to gather new hats, scarves, and mittens. All these items go into a donation bin that’s located at Risen Christ in the teachers’ lounge. “There’s just a lot of people looking out for our kids to keep them warm,” O’Keefe says. 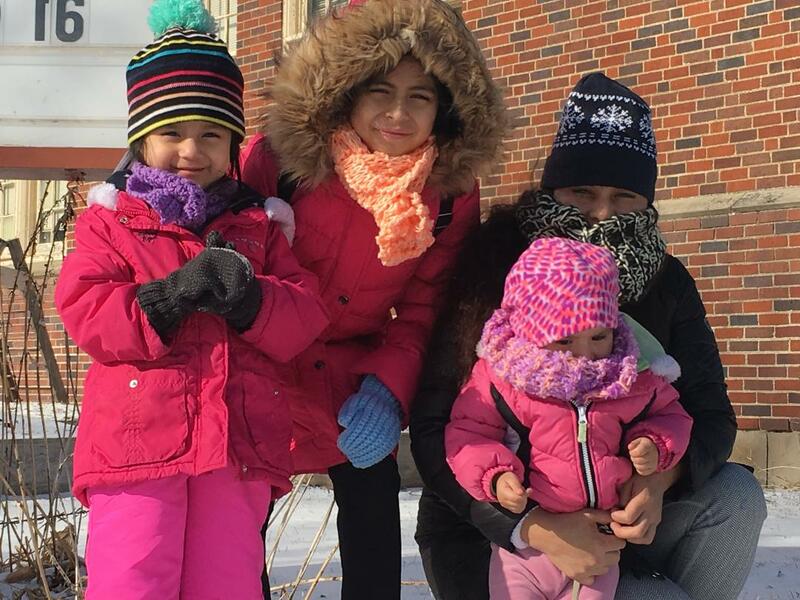 The hazards of a Minneapolis winter — temperatures stuck in the teens and single digits – are particularly dangerous for homeless families. O’Keefe is helping several homeless families who are doubled up with other families. She’s working to help them find new, affordable housing within Risen Christ’s public-school busing district because the public school system provides transportation to Risen Christ. O’Keefe also works hard to prevent families from becoming homeless. To do this, she draws on support from St. Joan of Arc Parish where parishioners give money to the Care Fund, which helps families who need financial assistance with things like rent, utilities, or gas for their cars. O’Keefe says it’s easy to see the weight lift off parents’ shoulders for that month. The Care Program includes a specific partnership with Risen Christ families who have emergencies and need help paying rent or utilities for one month to keep them in sustainable housing.